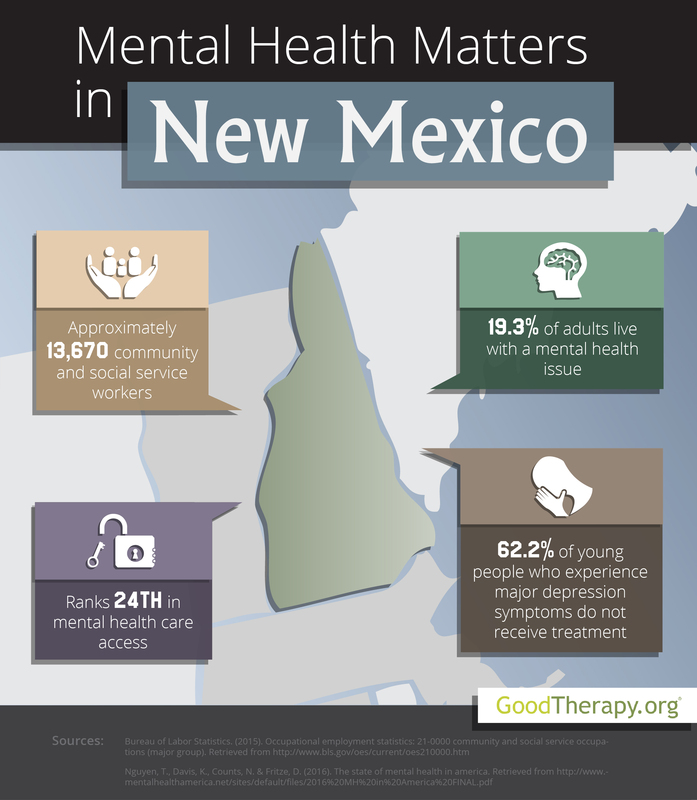 Find a therapist in New Mexico with GoodTherapy.org. Data collected from the United States Census Bureau suggests more than 2 million people live in New Mexico. About 15.8% of the population was age 65 or older, while 23.8% was under 18. Roughly 50.4% of the population is female. Occupational data from the Bureau of Labor Statistics (BLS) revealed 13,670 people in the state were working in community assistance and social service fields in 2015. Typical jobs within this sector may include working at residential treatment centers, schools as health educators, clinics, depression treatment centers, hospitals, community centers, correctional facilities, foster homes, and mental or behavioral health rehabilitation centers. According to the BLS, therapists in New Mexico, as well as people in related social service fields, earned about $42,090 annually. In Mental Health America’s (MHA) annual comparison of mental health conditions across the country, New Mexico was given an overall rank of 36th. New Mexico was also 33rd in adult ranking, 40th in youth ranking, 24th in access to mental health care, and 44th in prevalence of mental health issues. Analysts from MHA believe there is a relationship between New Mexico’s low prevalence ranking—which indicates a high rate of mental health condition—and other social elements such as high unemployment rates, violent crime, and poverty, and low of rates of high school graduation in the state. Recent research indicates substance dependence is a significant issue among adults and young people in New Mexico. Therapists and other mental health professionals from MHA claim 9.8% of adults and 7.2% of adolescents in the state demonstrate dependence on drugs or alcohol. The state was ranked 45th and 51st in these respective categories. The Substance Abuse and Mental Health Services Administration (SAMHSA) reports that in 2012-2013, a higher percentage of young people in New Mexico engaged in illicit drug use than in the country as a whole. Depression among the younger population is another matter of concern for therapists. In New Mexico, approximately 10.7% of young people have experienced an episode of major depression in the past 12 months. With these issues affecting the population, easy access to mental health care is important. Mental Health America reports New Mexico is ranked 6th in mental health workforce availability—with a ratio of 295 residents to every mental health provider. However, Mental Health America also reports New Mexico is ranked 44th for adults with mental health issues who did not receive treatment. Nevertheless, therapy and other mental health resources may be effective. Individuals in need of care are encouraged to find a therapist in New Mexico, as the SAMSHA 2014 study reveals both adults and adolescents report improved functioning after receiving treatment from the public mental health system.